As an African football enthusiast you all are probably looking forward to see your team participating in the AFCON 2019 in Cameroon [whose faith to host the Africa Cup of Nations 2019 isn't really confirmed due to quite a couple of unsolved issues]. According to the Confederation of African Football [CAF] President, a final decision as regarding whether or not Cameroon will still remain as the AFCON 2019 host will be decided on the 30th September, 2018 by the CAF executives. In spite of this controversy, quite a great deal of African football fans all around the world are more than eager to know their national team standing and chance of qualifying for next year's AFCON 2019 competition. We are going to use a couple of metrics to predict teams qualification, but not in any way guarantee if a team qualifies or not. So going by the above metrics, we are going share with you our top-notch prediction for the 24 national teams expected to qualify for the 2019 Africa Cup of Nations. Senegal: Having top the group with 4 points from 2 matches, Senegal remains the number one group favorite. Madagascar: With 4 matches left to the AFCON 2019 qualifiers roundup, Madagascar has made a significant improvement over the last few months having engaged in quite a couple of competitive matches. Madagascar sit 2nd in the group with 4 points [same with Senegal]. Cameroon: Qualifies automatically as the hosting nation. Morocco: After a frustrating show at the 2018 FIFA world cup in Russia, Morocco has now become a force to reckon with, won 1/2 of the qualifying matches with 4 more legs to go. They are obviously the group favorite looking set to join the host. Mali: Claiming maximum points from 2 matches see the Malians sitting comfortably on top of the group with 6 points. Gabon: 2017 AFCON host nation with lots of talented young stars to count on. They have the qualities to make it out of the group. Algeria: Topping the group with 4 points from 2 matches isn't too bad if you ask the Algerian fans. They are the group favorite. Benin: Though not doing quite well as many might have expected, but they simply have nothing to worry about at the moment. Nigeria: Just like their Egyptian counterpart, the Super Eagles of Nigeria during the 2018 world cup in Russia were made to believe that "jersey doesn't play play football" and that "parading the best jersey is not tantamount to winning". The Super Eagles were eliminated from the group stage after failing to grasp a point in their final group match with Argentina, leaving them with no other option than boarding the next early morning flight back home. However, they are dramatically picking up the pieces, they outclass Seychelles by 3-0. The are clearly the group favorite with so much talented youngsters flooding the squad. South Africa: Though failed to make the cut to the FIFA world cup 2018, but the Bafana Bafana are obviously not going to miss out on this upcoming AFCON 2019 [if you ask me] as they have all that it takes to qualify from the group. Ghana: Lost to Kenya 1-0 on matchday 2, but the Black Stars are still very much in contention with other group foes. Ghana are still left with a plethora of chance to make it out of the group. They sit top of the group with 3 points [on goal difference]. Kenya: A resounding victory was again recorded by the Harambee Stars when they thrash one of the Africa's greatest [Ghana] with a narrow goal margin of 1-0. However, this hasn't in any way makes Kenya the best team in the group, but has further complicated things to all the 4 contenders as each of the team has LOST one and WIN one, leaving them with 3 points each. Hence, subsequent matches will decide who qualifies. But however, Kenya remain in the best position to qualify from the group. Zimbabwe: For once, The Warriors were at the top of the game during their encounter with the Congolese in the matchday 2 encounter, though it's not the kind of result they wanted as they drew 1-1 with Congo, but has surely put them at the top of the group with lots of chances to make it out of the group. DR Congo: D.R Congo took no chance during the qualifiers match against Liberia and it paid off a great deal as they went home with the adage that says "half bread is better than none" singing in their head. And yes, they did absolutely well and are now 4 points sitting second on the group. Guinea: Many [including myself] would have expected much convincing scoreline to what we had after 90 minutes of play between the Guineans and the CAR. Not everyone knows about the Central African Republic [CAR] national team, but that didn't stop them from causing an upset to the Guineans though the match ended 1-0 in favor of Guinea. Guinea has always been presents when it comes to the Africa Cup of Nations. Ivory Coast: At the mention of Ivory Coast one unique picture comes into mind, and that is the 2013 Ivorian AFCON Squad that consisted Didier Drogba, Yaya Toure, Kolo Toure, Solomon Kalu, Gervinho, Arouna Koné, Didier Zokora, Emmanuel Eboué to mention but few. Those were the golden generation of quality players, but they are still one of the group favorite. Mauritania: It was horrific seeing the 2013 African Cup of Nations finalist [Burkina Faso] bowing to Mauritania in what was seen by many as the greatest achievement in the Mauritanian football history. Mauritania are topping the group with 6 points after picking 3 points each from Botswana and Burkina Faso respectively. Burkina Faso: After a shocking defeat to Mauritania in the last qualifiers match, Burkina Faso is still a force to reckon with as they are currently second on the group with 3 points from 2 matches. Tunisia: Being the only African team to concede a whooping 5 goals in a single match in Russia was horrible and a pierce to the heart to not only the Tunisian fans, but also to African football lovers. Though things has since change as Tunisia is just a couple matches away from qualifying to the AFCON 2019. Egypt: After failing to impress in Russia 2018 world cup—losing 3/3 of its group matches to Uruguay, Russia and Saudi Arabia respectively—they are fast getting back to shape as they humiliate Niger 6-0 at home. Goals from Salah, Elneny, Mohsen, Ashraf and Marwan Mohsen saw the Pharaohs going second of the group after a slow start where they lost 1-0 to Tunisia on match day 1. Mozambique: Sit second on the group with 4 points from 2 matches. They've had a much more better productivity in the field of play compare to in recent times. Zambia: Lost 1, drew 1 [against Namibia]. 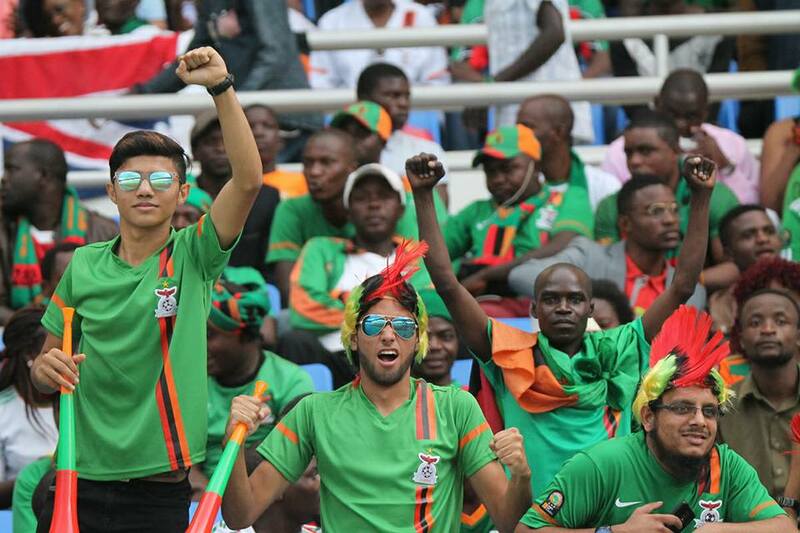 Zambia is now set for the real game after a slow start to the qualifiers. The 2012 AFCON winners will be looking forward to utilize the computer the have in the squad to get the job done once and for all. Uganda: Too many wasted chance saw this both teams having to manage a point each [during the qualifiers] which is not enough to save them on the rainy days ahead. In the other hand, Uganda feel so pleased having find itself at the top of the table with 4 points. Tanzania: Having fall in the same group as Lesotho and Cape Verde. Tanzania will be hoping to make their first appearance in the Africa Cup of Nations since 1980. Do you have any personal opinion as regarding this post? Please do us a favor to COMMENT using the form below.